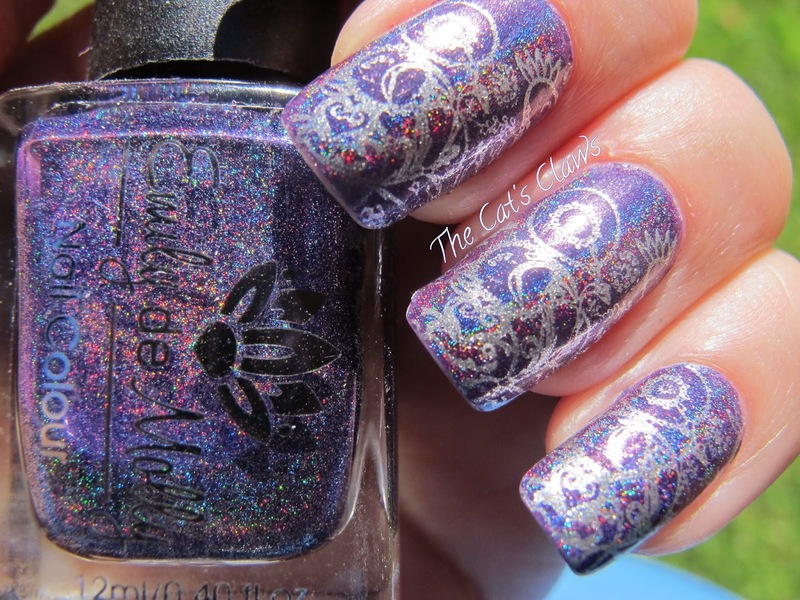 My Mundo De the Unas stamping polishes finally arrived! And they were well worth the wait. 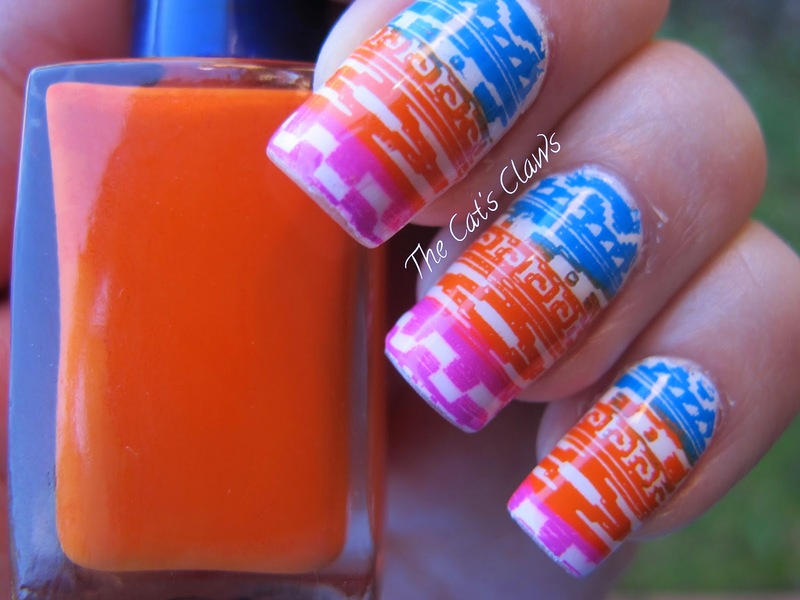 For those in the know Mundo De Unas are the stamping polish to use. 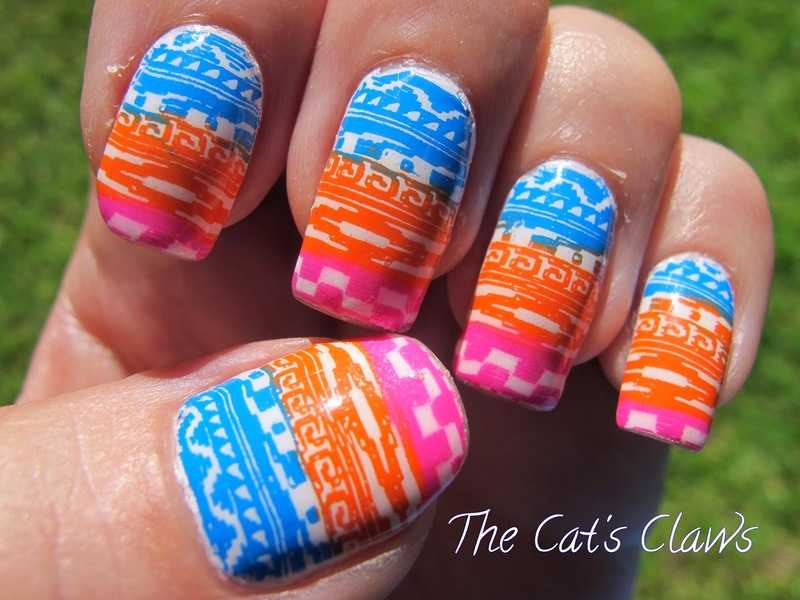 They are bright colours that stamp perfectly over black and white and every other colour in between. First of all I chose Sinful Colors Snow Me White two coats as the base colour. Then being spoilt for choice in my recent Mundo De Unas additions I decided to use the Aztec design on MoYou London Pro Collection XL 06 in three colours. The bright blue is #4, the pink is #15 and the orange is #53 which are all part of the Confetti collection. 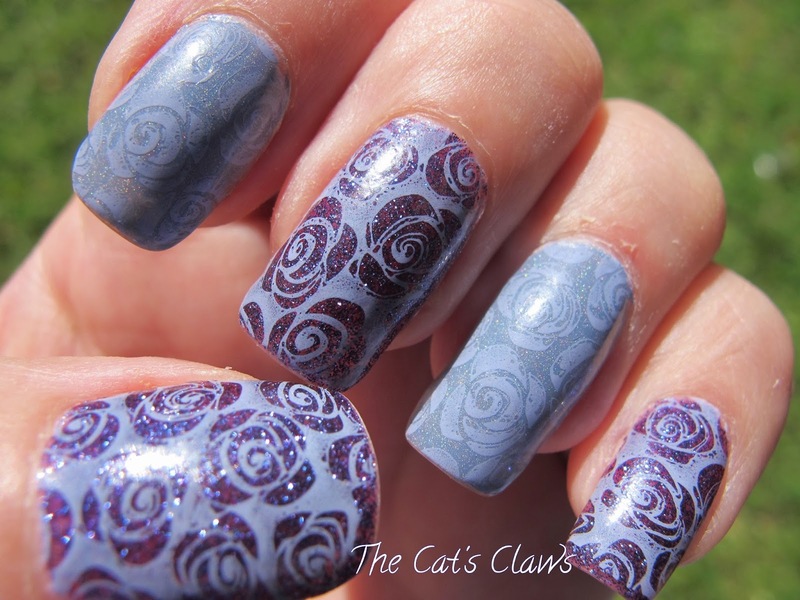 I must say these stamping polishes are amazing! 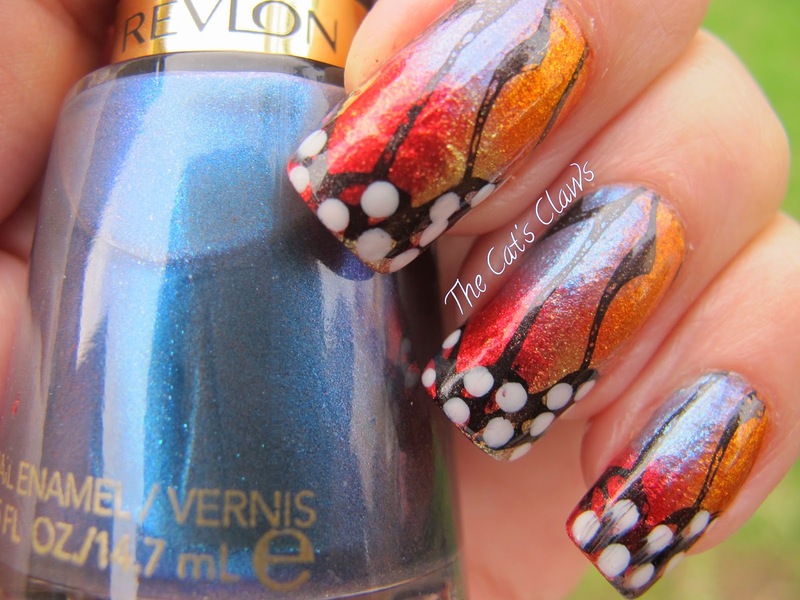 Continuing to play with Revlon's Spiderman Collection, and having a lot of time on my hands I decided on butterfly wings using MoYou Pro Collection XL 09. I chose four colours and sponged them on so no hard lines in the demarcation zone. 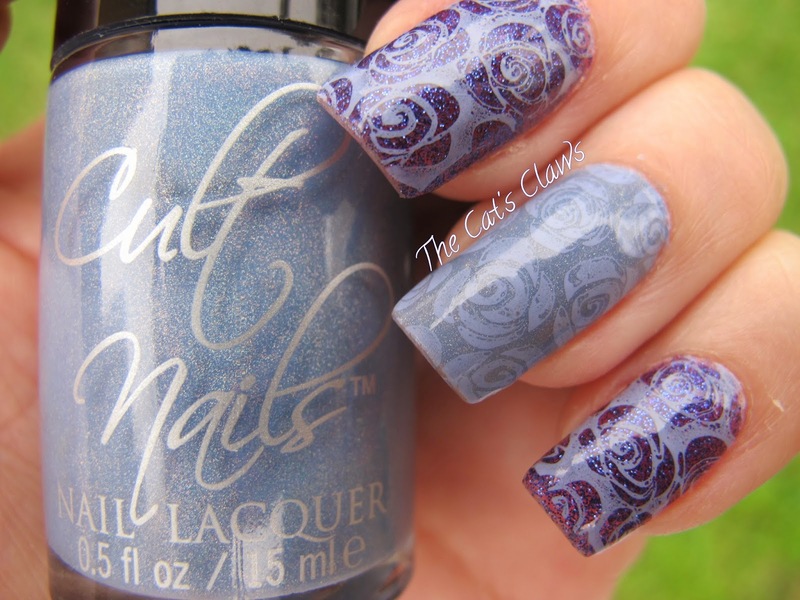 This is I'm Electro, a very beautiful blue that I can't quite decide if it is duochrome showing faint pink/purple at certain angles as well as a foil. I think this is easily my favourite out of the whole Spiderman collection. 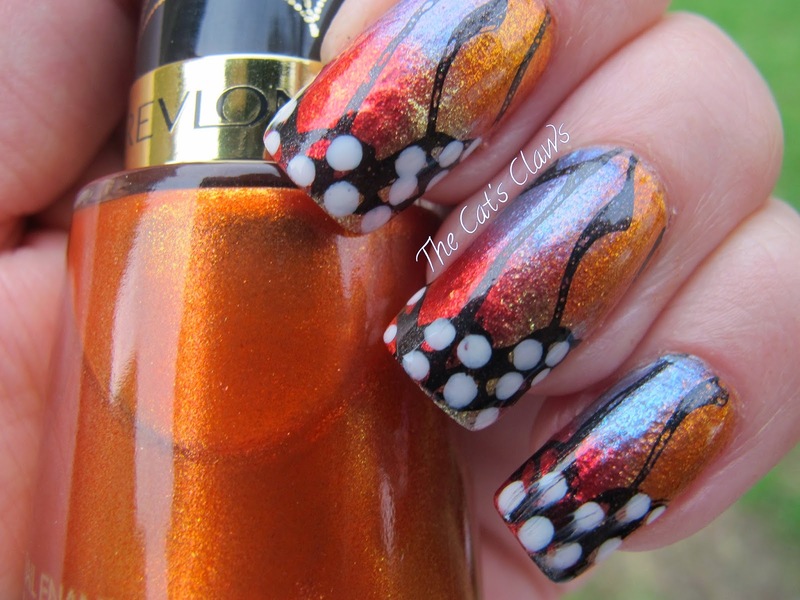 Electrified Web, a beautiful orange, a deeper colour than Kleancolor Metallic Mango. On a side note how cool are these names? The two other colours gold 1000 Volts and the red Spidey Sense you have seen in more detail here. 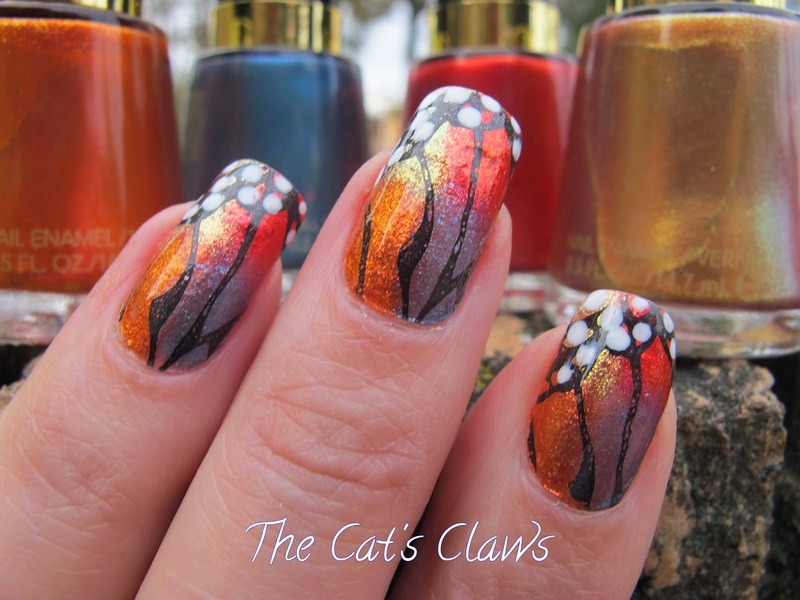 Now that you have been introduced to all the colours lets move on to my mani as I said all four colours sponged on together. Then stamped with MoYou Pro Collection XL 05 using Kleancolor Metallic Black and the white dots added using Sally Hansen White On and then finished with Seche Vite top coat. 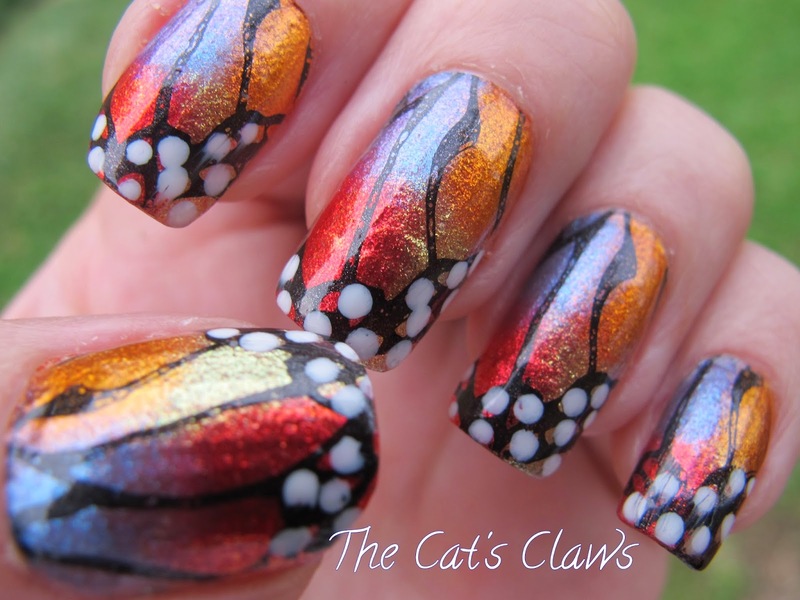 Even though this mani was a bit out there, I still enjoyed wearing it for the week! 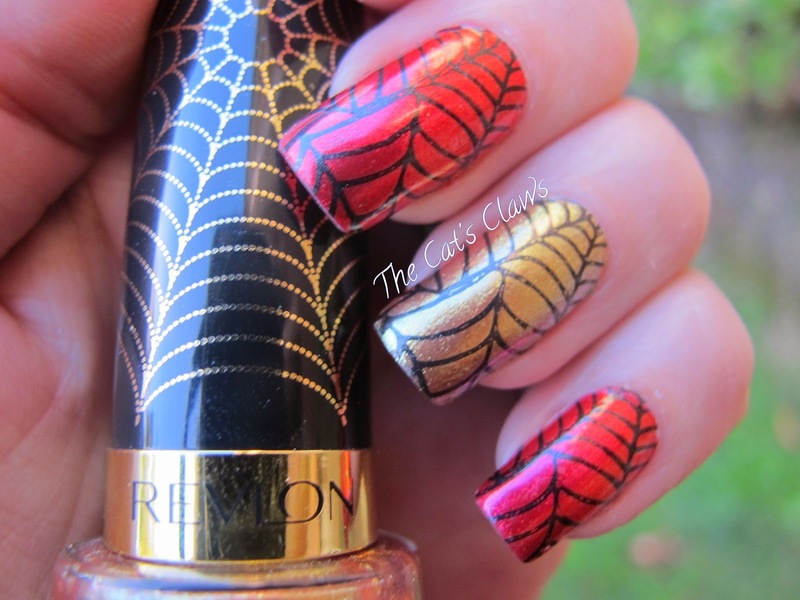 The Revlon Spiderman Collection seems to have been launched in Australia with out that much fanfare and yet it is a stunning collection of six foil polishes with tops adorned with gold spider webs! Even though I'm not into Spiderman or any other comic characters I could not pass these by. Did I tell you how much I love the tops? No? Well I do, they appeal to the shiny collector in me! 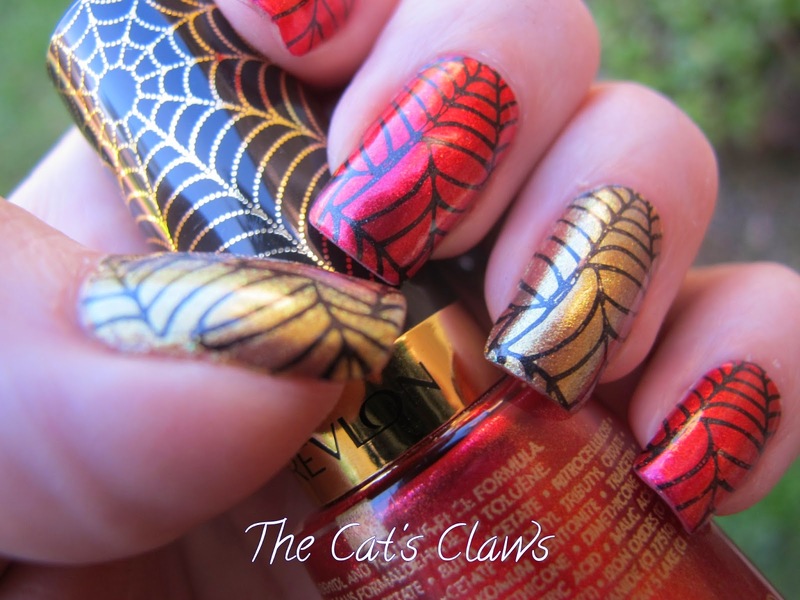 So on to my mani then the red is Revlon Spidey Sense two coats and the gold also two coats is Revlon 1000 Volts. 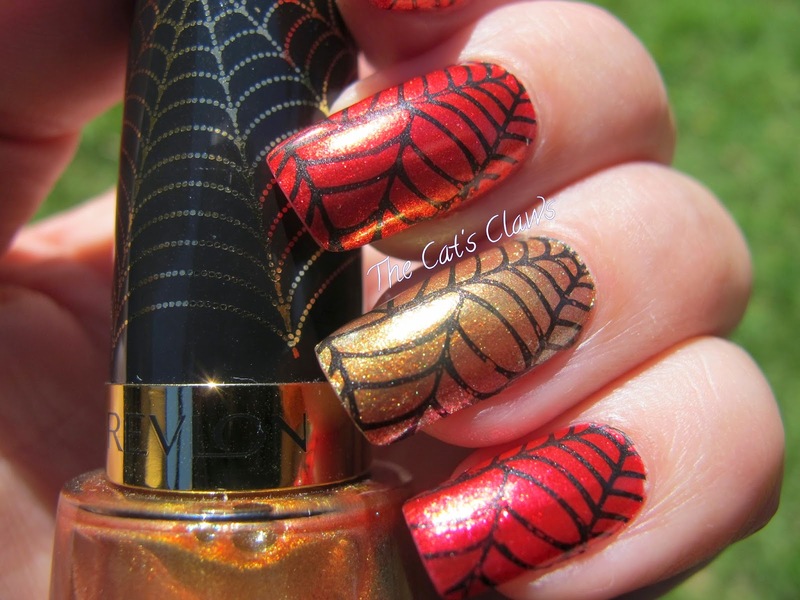 And how could I not use MoYou London Pro Collection XL 05 the large spider web. 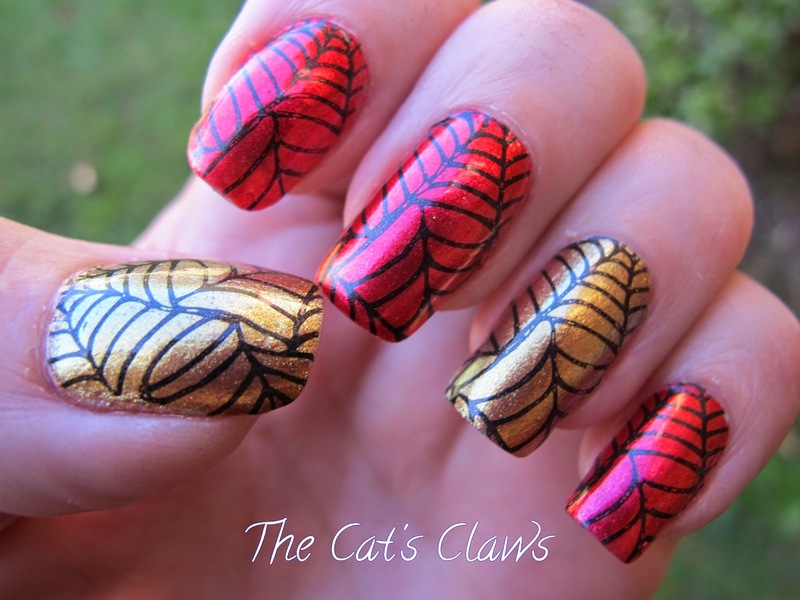 I absolutely love this mani it is just so striking and I think it is my best stamping yet. 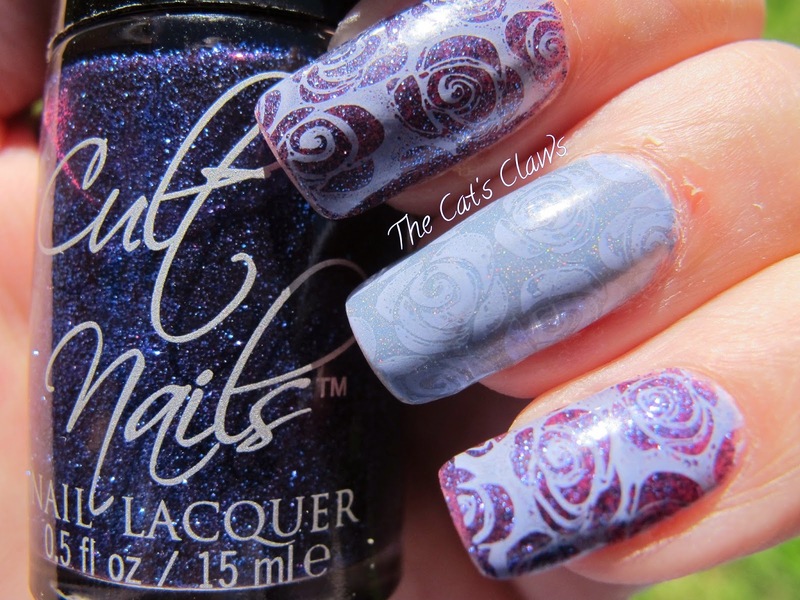 Or in other words, MoYou London Pro Collection XL07 roses yet again. 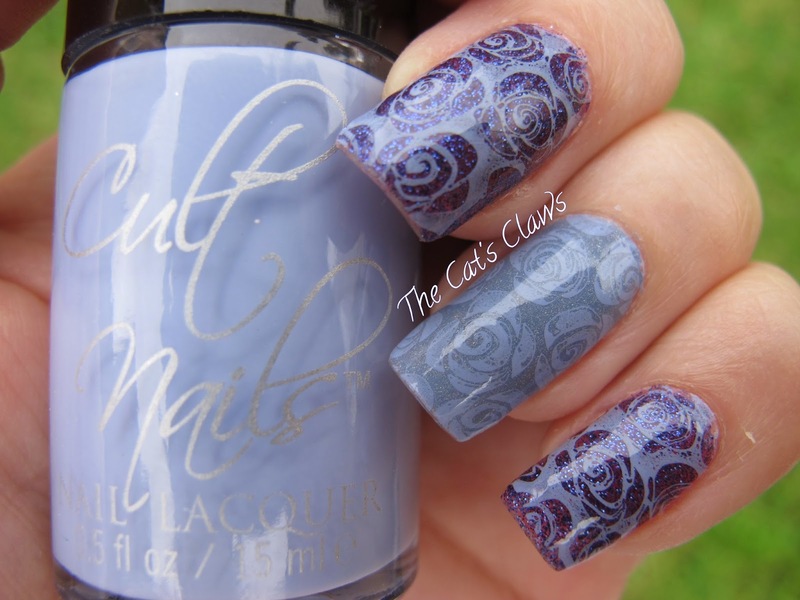 But don't let this detract from Cult Nails Casual Elegance collection, these colours are divine! And my favourite is Winter's Light, which is a blackberry jelly base teeming with blue and purple tiny glitter dust that just sparkles so much. The holographic periwinkle shade Intriguing was just two coats on my ring and index fingers, Seche Vite did not dull this beauty at all. 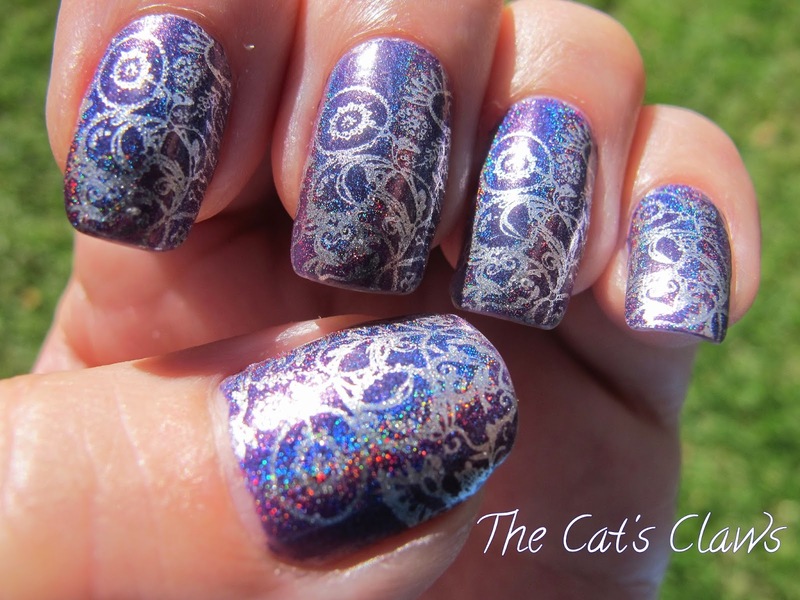 And to be quite truthful I was amazed at how silky smooth the application was ... the best out of all my holo polishes! I was unsure if I would be able to stamp with Casual Elegance as this polish is on the thin side but I did and I was happy with the result. 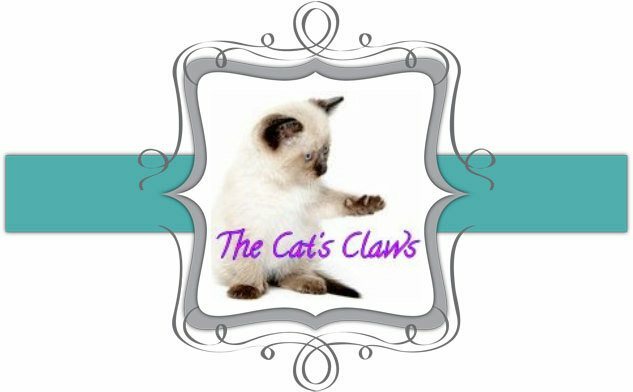 I'm also pretty certain Casual Elegance is a perfect match for some special dresses to be worn early next year! Please excuse the tip wear in the sunlit photos, as the sun finally made an appearance after three days and I was able to get some sparkly photos for you. All in all, I love this collection.